Relaxing in a PDC Spa hot tub is the ultimate in effective, natural relief for your entire body and mind. 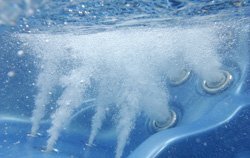 Thousands of air bubbles combine with warm water to caress the body parts that suffer the brunt of the day. 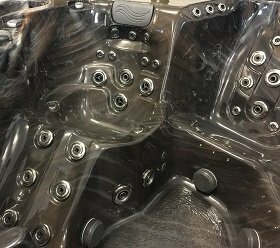 Specifically selected Reflections™ hot tub jets, trimmed in brilliant stainless steel, are positioned at strategic body points offering healing therapy to shoulders, neck, back, legs; right down to the feet! At PDC Spas it's the performance that matters. If the jet pump power is not balanced with the jet count you can have too many jets and not enough pressure to deliver that effective relief you need. We match the balance in each and every PDC spa model. Whether there are a few jets in just the right positions or over 100, the performance is relaxing, healing and something you will look forward to each day. Powerful hydrotherapy jets are adjustable and interchangeable customizing your spa experience to best suit you, and without ever having to leave the spa. 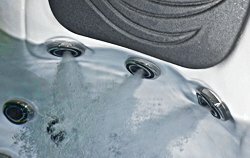 The Luxury Series hot tub models feature a PDC exclusive, Air’assage™ Therapy system for a soft full body massage you won’t find in other brands. For more info on this unique feature, click here. Lie back and relax. Rest on the soft air-filled pillow and soothe away neck and shoulder tension with our line-up of adjustable, powerful jets easily aimed at the exact point where comfort is needed.